A Canadian doctor appearing on Sen. Bernie Sanders' (I., Vt.) podcast highlighted the year-long wait times in a health care system similar to the one that Sanders supports. Dr. Danielle Martin appeared on Sanders' podcast, the Bernie Sanders Show, to discuss the Canadian single-payer health care system. 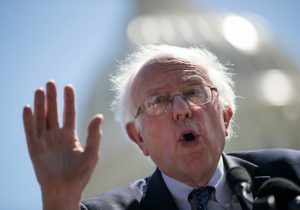 Sanders' Medicare-for-all bill, which went to the Senate floor on Wednesday with 15 Democratic co-sponsors, is intended to create a similar system in the United States. Sanders brought up some misgivings Americans may have about living under a health care system similar to Canada's. "There is concern about waiting time, for example," Sanders noted. Martin explained that Canadians do not wait for urgent or emergent care, and insisted that outcomes are "excellent" for those conditions. "Having said that, we do have a problem with wait times for what we call elective or non-urgent procedures," Martin said. "If I have a patient who's got migraines and I need advice about how to manage it, they might wait several months to see a neurologist for a non-urgent problem like that. Or non-urgent surgeries, the classic example being a hip or a knee replacement," she said. "So how long will it take me in the average?" Sanders asked. "It depends on where you are in the country. Sometimes it’s a few months, sometimes it's a year," Martin said. "In some places, it's sometimes been even longer than that, that people wait for a hip or a knee replacement," she said. Martin insisted that that status quo was "totally unacceptable." "And I think that is totally unacceptable. I don't think that we should stand for it in our system. I think that there's no reason why people should have to wait," she said.